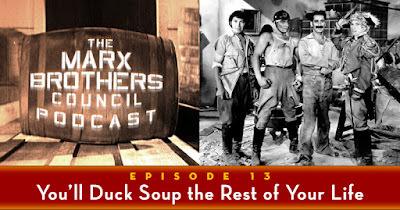 The Marx Brothers Council Podcast: Bonus Episode: More Marsden! And we're back, with a little something extra. 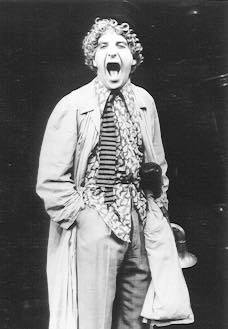 You will recall that Episode 4 of the Marx Brothers Council Podcast included an excerpt from Noah's recent interview with masterful Marxian revivalist Les Marsden. As soon as it was released, adamant crowds gathered at our doors to demand that we release the interview in its entirety. Not ones to say no to an angry mob, we're pleased to present the whole strange interlude, as a bonus episode, right now. "The full-length interview with actor / musician / writer / director Les Marsden, who has portrayed three of the brothers onstage, in addition to writing and starring in the one man show A Night at Harpo’s. Among the topics Les discusses with Noah are audience expectations, learning to play the harp, pitching the one-man show to Harpo’s widow Susan, and his encounter with Groucho. End Music: 'Why Am I So Romantic?' (from Animal Crackers), as performed by Les Marsden." As always, if you enjoy the Marx Brothers Council Podcast, we invite you to discuss this episode here on the blog, or in the Marx Brothers Council Facebook group; and if you feel the urge to write a positive review on iTunes, or anywhere else, we'd certainly appreciate it. No Les as Zeppo clips? Hi guys, love the show. Like yourselves I grew up on the team, saw all the movies, read all the books, even played a Brother or two on stage. I consider the Marx Brothers THE comedy team; evergreen (Only not so much that I'd ever bore a hole in a Marx Brother and expect sap to run out!). Thanks, Jim! I feel the same way -- they are THE comedy team. They're Mozart, they're Shakespeare! And Thomashefsky, Mighty Lak' a Rose.